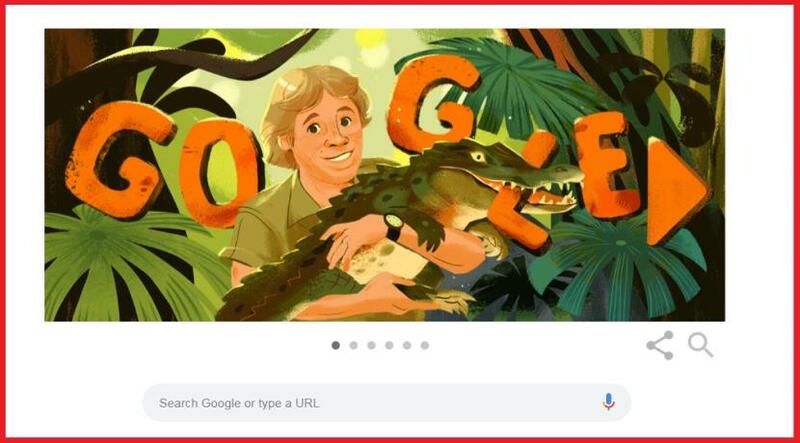 NEW DELHI: Google on Friday dedicated a doodle celebrating wildlife conservationist and television personality Steve Irwin's life and legacy, whom many grew up watching wrestling giant crocodiles in the Australian wilderness. A zookeeper by profession, Irwin achieved worldwide fame from his television series "The Crocodile Hunter". A typical "Aussie" mate, who would have been 57 on this day, created the runaway hit show that was seen in more than 100 countries by over 500 million people. Doodle guest artist Shanti Rittgers created the slideshow of six images that told the story of Irwin, who inherited his love for the reptiles from his parents Lyn and Bob Irwin when they gave him an eleven-foot python for his sixth birthday, the Google blog post said. Irwin who was born in Melbourne suburbs in 1962 named his first slithery friend Fred and later went on to introduce a whole new generation to reptiles, which could also be loved. Through his work at the Australia Zoo and his popular TV series, Irwin and his family and even his future generation dedicated their lives to the preservation and appreciation of Earth's wildlife and wild places. During the early 1970s, father, mother and Steve Irwin moved to the Sunshine Coast in Queensland and opened the Beerwah Reptile Park that has an annual footfall of seven lakh. Learning to wrestle crocodiles since the age of nine, Irwin volunteered with Queensland's "East Coast Crocodile Management Program", helping to capture and relocate endangered saltwater crocodiles-the largest of all living reptiles-to protect them from being harmed. He was involved in all aspects of managing his family's park, which was renamed Queensland Reptile and Fauna Park, and eventually the Australia Zoo. Soon after taking over the park's management, Irwin met his future wife Terri who was visiting the zoo. They spent their honeymoon capturing crocodiles, and the footage they shot became the first episode of "The Crocodile Hunter".